What a wonderful experience working with Rachel, David and Kay. While we're up in Northern Michigan, The Office of David S. Hankus was the right choice. 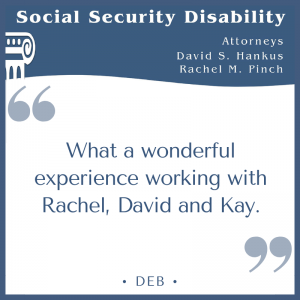 Sadly, the local attorneys who advertise SS Disability Claim help, made us feel as though we were bothering them. Another N. MI friend recommended Hankus and it was smooth sailing from that point on.